Many years of advocating for a CBC board of directors that’s free of partisan political appointments has paid off for CWA Canada’s largest Local, the Canadian Media Guild (CMG) and its allies. Heritage Minister Mélanie Joly announced today the creation of an independent advisory committee, whose members are experts drawn from the media industry, to provide a list of qualified candidates the government can consider to fill vacant positions. The CMG, which represents most English-language staff at the public broadcaster, commended Prime Minister Justin Trudeau for keeping his election promise to ensure that the board and president will be chosen independently. Friends of Canadian Broadcasting have run numerous campaigns aimed at preserving the CBC, increasing its funding and getting politics out of its governance. Friends has occasionally joined forces with the CMG and other unions or advocacy groups to bring about changes at the CBC. CMG noted in a statement that it has “also called for a board that includes employee representatives chosen by CBC’s unions. Ensuring employee representation on boards is a practice that has proven invaluable in other sectors and other countries. 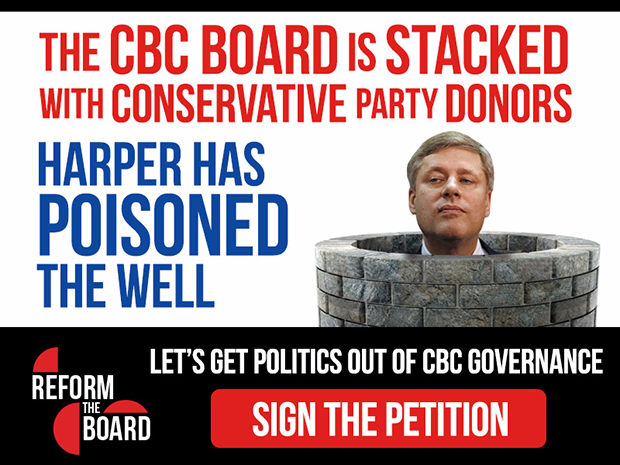 During the 2015 federal election, the CMG ran its Champion Public Broadcasting campaign in which it made five proposals and urged their adoption by the national political parties.